Heat oven to 375°F (350°F for dark or nonstick cookie sheets). In large bowl, beat cake mix, butter, shortening and egg on medium speed about 1 minute or until blended. Onto ungreased cookie sheet, drop dough by rounded tablespoonfuls 2 inches apart. Bake 9 to 12 minutes or until light brown around edges. Cool 1 minute; remove from cookie sheet. Cool completely. Frost with frosting. Store covered. Fun idea! 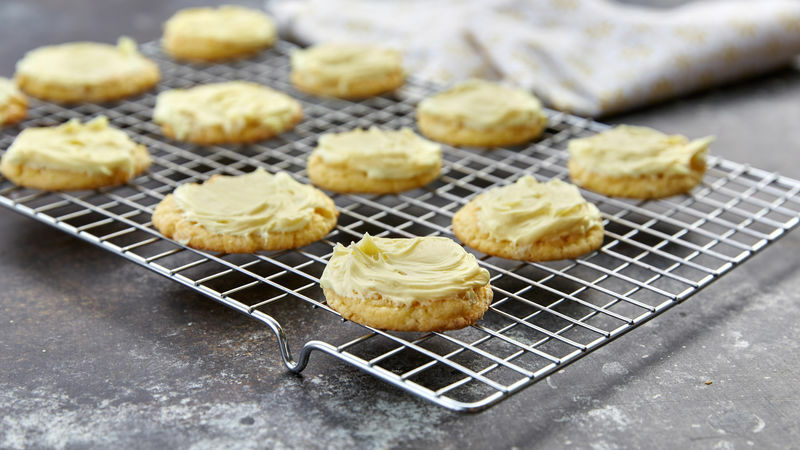 Pick up a lemon-shaped cookie cutter from a cake decorator supply store or craft store. Make lemon cookies using the rolled cookie directions. Your cookies will shape up to their great taste. Rolled Cookies: Divide dough into 4 equal parts; roll each part 1/8 inch thick on lightly floured surface with cloth-covered rolling pin. Cut into desired shapes. Place on ungreased cookie sheet. Bake 6 to 8 minutes or until light brown around edges.